Overtime Regulations Changes "On Hold"
On Tuesday, November 22nd, a Federal judge in Texas ruled that the U.S. Department of Labor exceeded its authority by changing the overtime rules and qualifying standards regulated by the Fair Labor Standards Act (FLSA). This means that local employers must now decide whether they wish to (1) proceed with the changes they had prepared to implement on December 1st or (2) revert back to policies in effect prior to the proposed regulation changes. 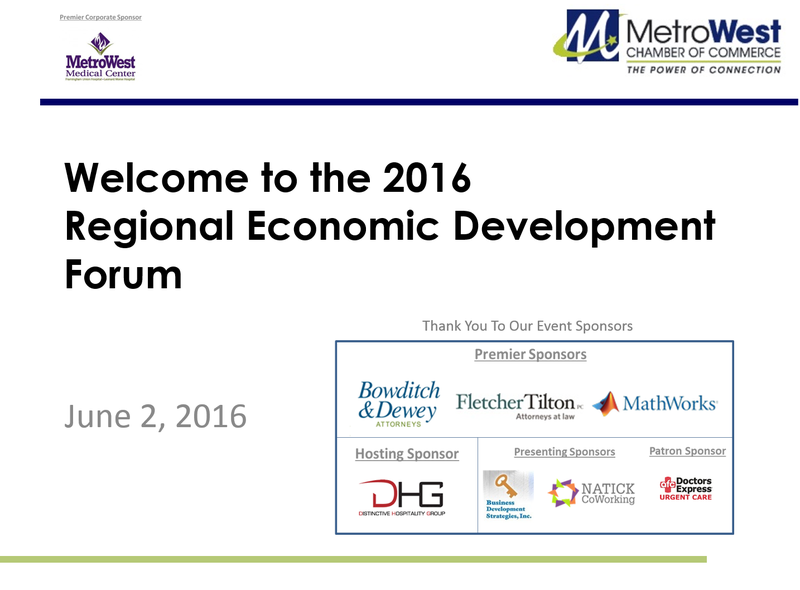 On June 2, 2016, the MetroWest Chamber of Commerce hosted an Economic Development Forum at the Verve-Crowne Plaza in Natick. Presenters included local, regional and state-level experts in planning, business/developer incentives and economic development. To view the presentation slides, please click the image below.